What better way to celebrate your 75th anniversary than rolling out your first jet aircraft. 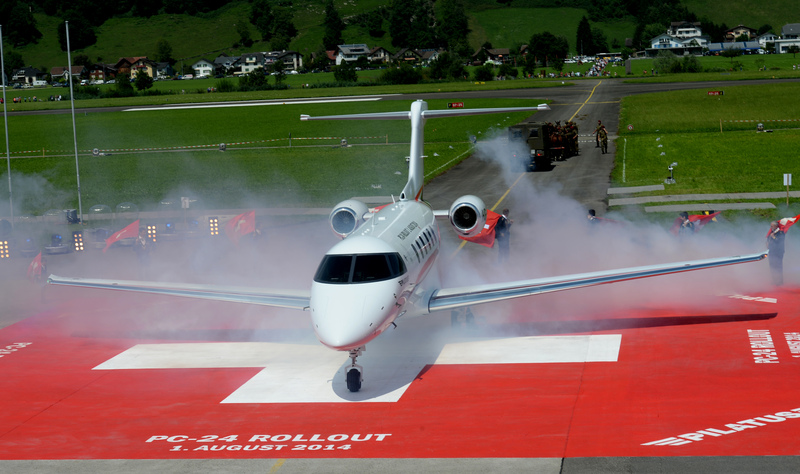 Yesterday in celebration of the milestone anniversary and Swiss National Day, Pilatus rolled out its new Williams International FJ-44-4A powered PC-24 line CN: P01 at Buochs airfield. The slightly delayed rollout kicks off a two-year type certification campaign with first flight tentatively scheduled for March 2015. “When you are building an aircraft, every day is a compromise. Either you are too heavy, or not fast enough or you are not innovative enough on the avionics” – Oscar Schwenk, Pilatus Chairman. A second aircraft to be used in avionics and system testing will roll out in February, while a third will follow in Summer 2015. The aircraft remains too heavy, within the never exceed weight, but outside the specs initially promised, with work on weight reduction continuing. Certification is expected in 2017 with production spots sold out for next three years. Locally, the RFDS has ordered 3 PC-24s with an option on one additional aircraft for its Western Australian division. All images courtesy of Pilatus.